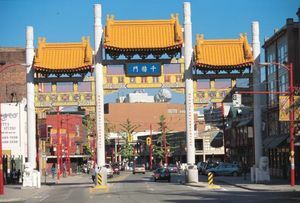 Start at the Millennium Gate at Taylor St. & Pender St.
One of the largest Chinatowns in the western hemisphere, Chinatown Vancouver is a fabulous, fun and vibrant place to stroll, explore, eat, and--of course--shop! Packed with a wide variety of stores, shopping in Chinatown holds more surprises than you may expect. It's a great place to shop for Chinese imports, furniture and clothes, unique gifts, home decor (and not just Chinese decor), and jewelry. There are plenty of fresh fruit markets, food markets, Chinese medicine shops, and Chinese-language books, music and DVDs, too. Start shopping by making a dramatic entrance into Chinatown through the Millennium Gate, at the junction of Taylor St. and Pender St. Check Translink for bus schedules, or take the SkyTrain to the Stadium-Chinatown Station and walk east on Keefer St.
For drivers, parking is easy in Chinatown. Most streets have metered parking, and there are several large, pay-parking lots in accessible locations. On the other side of Pender St. from Bombast--and next door to the Chinese Cultural Centre--is the Chinese curio and art supply store Chinese Art Crafts. Chinese Art Crafts has a host of art tools and products, including a huge range of calligraphy brushes and supplies. Continue east on Pender St.
Just across Columbia St. is Ochi, a Chinese clothing boutique with fashion for women, men and children. It's easy to find cheap clothes in Chinatown, Chinese or otherwise; Ochi is one of the few high-quality clothiers. The clothes are a combination of traditional and modern design, and include beautifully-made silk gowns and jackets, pashminas and scarves, pants and shoes. There are two Ochi stores, each across the street from the other. The larger, two-story Ochi has a drink bar, too, serving refreshing juice, tea or coffee. Just a few doors east of Ochi is New Town Bakery, the best place to get steam buns in Chinatown. New Town Bakery has 13 different steam buns, ranging from $1 - $1.50, including pork, chicken, beef, sweet custard, and sweet lotus paste and egg yolk. New Town Bakery is a restaurant too, so you can have a snack or lunch. It's cash only, though, so be prepared! Across the street from the New Town Bakery is Chinatown's Chinese-import shop par excellence, the packed-to-the-rafters Bamboo Village. Long and skinny, the something-for-everyone Bamboo Village has everything from furniture and curios to worship supplies, paper lanterns, Maoist memorabilia, Chinese folk art and home decor. Go for the Gold at Ultimate 24K Gold Co. Image Courtesy of Ultimate 24K Gold Co. Walk east from Bamboo Village and turn right onto Main St. There's lots to see between Pender and Keefer on Main, including food markets and a terrific Chinese medicine shop. On the western side of Main St. you'll find Ultimate 24K Gold Co. (there are actually two branches on Main St.). Chinatown has its share of jewelry stores, but for reliable quality, Ultimate 24K Gold Co. is a good bet. Though gold is their specialty, Ultimate 24K also sells Burmese jade and South-Sea pearls, along with other gemstones and Canadian diamonds. There's an on-site goldsmith, too, for custom jewelry and repairs. Taste the Tea at Ten Ren Tea & Ginseng Co.
On the corner of Main St. and Keefer is the Ten Ren Tea & Ginseng Co., a specialty tea shop that's a fabulous place to find tea for yourself or as a gift; the teas are packaged so beautifully, you won't need wrapping paper! Ten Ren Tea has an enormous assortment of teas, from jasmine and oolong to more exotic blends. They also carry very reasonably-priced Korean, American and Siberian ginseng. They frequently have teas for sampling, too, so pop in for a taste of something new. Explore the Chinese Food Markets on Keefer St.
From Main St. and Ten Ren Tea, turn left (heading east) onto Keefer St.
Before Gore Ave and across from Hon's Wun-Tun House, there are several terrific Chinese markets, including Chinatown Supermarket, Four Seas Herbal & Health Products--which carries a large array of Chinese candy--and San Lee Enterprises. San Lee is a perfect place to shop for seasonal fruits. My friend Ellis heads there every May to find un-peeled, previously-frozen lychees. Want more Chinatown? Explore Chinatown's historic landmarks.